Portage Glacier Cruises is celebrating its 30th anniversary in 2019! The cruise runs five trips daily to Portage Glacier from May to September, and it’s one of the most accessible ways to see the glacier. Portage Glacier Cruises’ mv Ptarmigan is the only boat operating on Portage Lake. It takes travelers within 300 yards of the glacier, which currently still reaches all the way to the water’s edge. On the one-hour cruise, guests spend about 20 minutes idling slowly from side to side of the lake, watching and listening to the glacier with the option of standing on the ship’s top viewing deck or staying inside the fully enclosed, heated cabin. Portage Glacier is one of Alaska’s most popular attractions. Just an hour drive from Anchorage, visitors can board a Portage Glacier cruise and see the face of the active glacier and watch for it to calve into the lake. In addition to glacier views, a trip across Portage Lake can result in other exciting sights for visitors, such as wildlife and waterfalls. Black bears and mountain goats roam the sides of the surrounding mountains in the spring and summer. Portage Glacier Cruises makes sure that there always a few pairs of binoculars onboard for gusts to share. Travelers can also spot birds like black-legged kittiwakes, surf scoters and even bald eagles. To round out the sightseeing trip, hundreds of small waterfalls can be seen in the surrounding mountains and the mv Ptarmigan always makes sure to slow down as it approaches some of the larger falls that offer good photo opportunities. 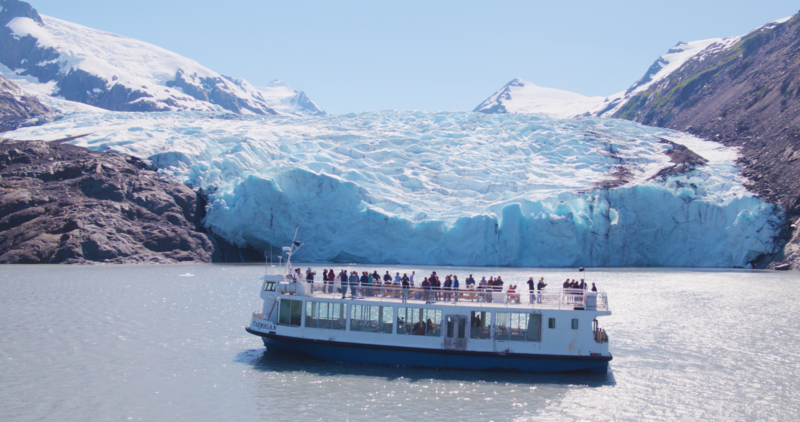 All these things and more make Portage Glacier Cruises a popular excursion with travelers; last season alone, more than 30,000 passengers took the day cruise. Marcelle Roemmich has been captaining the mv Ptarmigan for the last five years. To celebrate its 30th year of making Portage Glacier accessible to travelers, the crew of the mv Ptarmigan is planning a celebration on July 30. Former employees will join current crewmembers on the 4:30 p.m. cruise that day for a champagne toast in front of the glacier. This celebratory cruise is also open to the public, so book your tickets today!